Police have arrested 6 supporters of APRC and the United Democratic Party (UDP) and are currently cooperating in their investigations after an alleged attack on a group of UDP supporters that resulted in some of them sustaining injuries. The unfortunate incident which Gambiano reported last Thursday, took place in Tallinding says the Police PRO Inspector Foday Conta. “On Thursday 30 March 2017, between 2300hrs and 00.00 hrs three women, namely Isatou Sambou, Maimuna Colley and Awa Jarju, all of Tallinding and APRC supporters, allegedly attacked a group of UDP supporters by stoning from a compound,” the Police PRO said, adding that Fatoumata Darboe, Kaddy Bajo and Kaddy Ceesay are the UDP supporters involved in fracas. 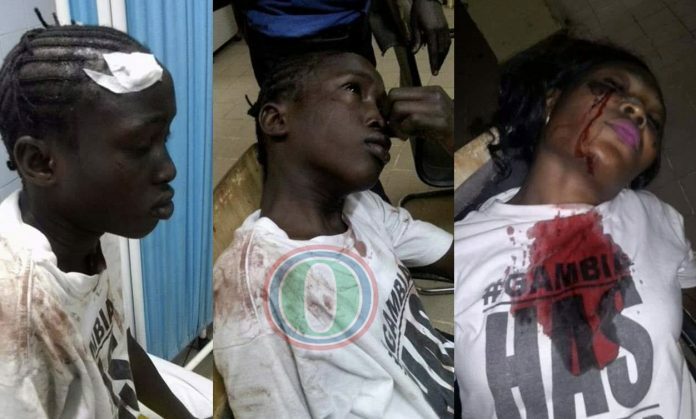 He said the group were heading to a campaign rally of UDP candidate Fatoumatta Jawara, when the incident took place leading to some UDP supporters sustaining injuries. The matter was reported at the Tallingding Police Station and the victims were escorted to the hospital where they received treatment, the police said. A case file was opened after the arrest of three APRC and three UDP supporters, who are currently helping the police in their investigation. PRO Conta said the Office of the Inspector General of Police “hereby urges the general public to respect diversity, be tolerant and allow people to manifest their support to the political party/ parties of their choice”.